Under a pile of rubble, there is always a jewel, no matter who or what it is or where it came from. Located 16 kilometers south of Glauchau, along the Mulde River, the city of Zwickau may look like an ordinary community, whose architecture mostly comes from the Cold War. This includes high-rise buildings, mining facilities, old factories and even bridges built using scarce materials possible but only lasting 40 years. In fact, a newspaper report from a local newspaper in Chemnitz revealed as many as 37 bridges in the district of 480,000 inhabitants (of which the city itself has 104,000 residents) that are in dire need of repair or replacement. Most of them had exceeded their expected lifespan by 20 years and are hanging by a thread because of imposed weight limits designed to keep trucks, tractors and busses off of them. But underneath the doom and gloom of a bygone era, there are some jewels to find. Zwickau prides itself on the automobile industry, where the beloved Trabant automobile was built- now the company belongs to Volkswagen. Audi was founded in this community in 1904. The world’s first known and popular automobile racing union was created five years later. It also has an international school (Saxony International in Reinsdorf) and a college of science and technology (Westsächsisch Hochschule), making the city a multicultural university town. It has a bridge building firm that has existed since 1854 and still has its base in the city. And when there is a bridge builder in the community, there will always be bridges, especially given its proximity to the river! The town was first mentioned in 1118 when the Slavs settled there, yet a half dozen bridges, mostly covered wooden ones were built to connect it with other villages by the 1500s. By the late 1800s, more than 40 bridges crossed the Mulde or surrounded the old town center. Today, if one subtracts the crossings carrying pipelines, only a quarter of the bridges exist in Zwickau, all are along the Mulde. And of these 10 known crossings, counting the Zellstoff Bridge, four of them are over 70 years old. Two of them however have received national accolades because of their unusual designs. They include the Paradiesbrücke- the only known bridge in Germany and the western hemisphere that has the cantilever pony truss design- and the 500-year old Röhrensteg- the only known covered bridge with multiple designs and functions, plus the oldest in Saxony. Both of these centerpieces will be profiled together with nine other structures that will include a couple near Wilkau-Hasslau(to the south) and a couple near Schlunzig (to the north). All of them were built before 1990, but they will present not only the historical aspects of the bridges, but also address the issues involving their ability to carry traffic. A gallery of pictures are enclosed for each bridge I stopped at during the tour in September. Built in 1954 replacing a wooden bridge destroyed in a flood, the Schlunzig Bridge may be a typical bland concrete beam bridge with little or no value, even if the structure is equipped with the ever so quickly disappearing set of street lighting from the bygone era. Yet its significance resembles two sides of a coin. On the one side, it is a typical East German Bridge, constructed using scarce materials that were prescribed by the Communist government- similar to the Wave at Wernersdorf (for more, see the tour guide on Glauchau’s bridges). Even the lighting originated from that era, which was considered too industrial for the region that is mostly oriented towards agriculture and nature. On the flip side, the bridge is a poster boy for the structural woes the region (and much of Germany) has been dealing with: a run-down structure that is unable to withstand increasing traffic or even weather extremities. The good news though is the district of Zwickau has approved the design and financial support for a new bridge. When the 50 meter long, Mulde crossing is replaced in 2018-19, in its place will be a more attractive bridge type that will awe even the bikers using the bridge to continue on the Mulde Bike Trail: the cable-stayed span! It will be interesting to see what it will look like when the bridge is back in service by the end of 2019. Three kilometers to the south, near Crossen, we have this bridge. The Schneppendorf Bridge features a three-span closed spandrel concrete arch bridge with a total length of 80 meters. Like the Schlunzig Bridge, this one stems from the East German days with typical lighting and railing. It also fits the stereotype of bridges that despite being between 65 and 90 years old (as I estimated its age during my visit), it is in need of repairs because of wear and tear, combined with structural neglect. The bridge has weight restrictions, still it serves as a backdrop to the scenery one can enjoy at a park and rest area located just to the south of the structure. As a bonus, especially for photographers, the bridge and another one just 100 meters to the north- a through truss bridge carrying pipelines across the river- both have a nice background with wooded hills and old-fashioned houses. That bridge had a 45° skewed portal bracing, similar to the next bridge located to the south of the arch bridge. Sadly though, this bridge was removed in 2017 after it was revealed that the structure was rendered useless and a hazard for boaters along the Mulde. Fast Fact: The bridge was in fact built in 1959 replacing an earlier span that had been built 21 years earlier but was destroyed in the war. Ironically, the 1938 span replaced an iron truss span that was built in 1878, replacing a wooden covered bridge from 1547. No pictures, postcards and drawings exist at this time, but if you have any that you wish to add please contact the Chronicles. Note: If you know more about this bridge in terms of its history and historic significance to the region, please contact Jason Smith at the Chronicles. The information will be added to the tour guide. The first vehicular crossing over the Zwickau Mulde when entering Zwickau is located in the northernmost suburb, Pölbitz. Located at Pölbitzer Strasse, west of B-93, this bridge connects Pölbitz with Eckersbach and provides direct access to the nearest town of Crimmitschau. While records indicated the first wooden bridge having been built 1511, the bridge was replaced with a four-span concrete Luten arch bridge in 1914, all with closed spandrels. The bridge withstood years of abuse as a result of flooding, war and lastly, neglect because of the lack of resources and know-how during the Communist era. The straw that broke the camel’s back came with the Great Flood of 2002, which caused extensive damage to the bridge, especially the arches. The city council reacted with a plan to replace the entire structure with a concrete cantilever span, similar to the picture above. The bridge was replaced in 2005-06 with the current structure, which includes some finials and a memorial on the east end of the bridge. A video showing the events involving the Pölbitz Bridge before and after the replacement can be seen below. It includes interviews with those involved in the replacement project and commentary from the anchor, a local who obviously forgot about the arch bridge except for its destitute state. Spanning the Zwickau Mulde at Kolpingstrasse and highway B-175 , this three-span structure features a concrete deck cantilever design. The bridge is one of the heavily travelled bridges in Zwickau for the crossing provides traffic in and around Zwickau as well as points to the west and north. The current structure was built in 1955 replacing a wooden combination trestle and Queenpost through truss structure that was built in 1898 under the name Socialist Bridge. The bridge was replaced with the current structure in 1955 but not before the floods a year earlier caused significant damage to the new bridge under construction as well as the truss bridge itself. Between 1898 and 1990, when the name was changed to Echersbach Bridge, the bridge was named with a socialist flair which started with that before changing to the Julius and Ethel Rosenberg Bridge. Given its age and its wear and tear because of weather extremities and congestion, the bridge has seen better days, and it appears that in the coming years with the increase in traffic, replacement may have to be considered. Only 150 meters north of the bridge is a pipeline bridge, built using steel plate girders. Built in the 1980s, the bridge carried hot water to Zwickau from sources to the east of the city. Abandoned for a decade, the bridge was removed in 2017 not only for liability reasons, but the residents nearby did not want to see an eyesore obstructing the view of the Mulde River valley. The Maritius Bridge is the first of two Mulde River bridges in Zwickau that carry the major highway B93 going south. The steel structure features two bridges: One built in 1992 to accomodate street car service going south and a parallel one built in 1994 to accomodate vehicular traffic. Both structures replaced the Bierbrücke that was built where the present-day Maritius Brewery is located. The structure was first mentioned in 1859 and was built of wood, even though it is unclear whether it was a covered bridge or another truss structure. Furthermore, we don’t know how long the bridge had existed at that time. After having been destroyed by ice and flooding multiple times, an iron structure was built in 1861. According to some of the postcards, the bridge featured a Town Lattice truss bridge and had three spans. Due to structural concerns, the bridge was closed in the 1970s. It was rehabilitated in 1975 to accomodate pedestrians and cyclists by replacing the truss spans with steel beam and was raised a meter to allow for free flowing waters of the Zwickau Mulde. Inspite of this, the partial permanent closure of the Bierbrücke resulted in a complicated detour through other parts of Zwickau where massive traffic had not been seen on residential streets. Because of lack of funding due to the economic conditions in East Germany during that time, reconstruction was only possible after the two Germanys were reunited. Come 1992, the first of two bridges were built to provide street car service to Eckersbach from the city center. By that time, the old Bierbrücke had vanished into history. Two lears later, as part of the B-93 expressway project, the second bridge was built for traffic. Today’s Maritius Bridge is the gateway to Zwickau from neighboring Glauchau and points to the north along the expressway connecting the city with Leipzig. 1. The bridge was the first one of its kind that features a cantilever pony truss design. Furthermore, it was the only known cantilever truss bridge whose trusses are supported by only one tower. Before the completion of the new Küblers Bridge in Lunzenau, located 45 kilometers downstream, in 2017, none of the bridges known in the western hemisphere had had that unique design. 2. The bridge was built in 1900 by a bridge-building firm Beuchelt & Company in Grünberg in Schlesia (now part of Poland), replacing a covered bridge, which was one of over 30 that were built in Zwickau. The predecessor was built in 1694 by Johann Georg Findeisen from Schellenberg at a cost of 200 Taler. The covered bridge was one of the fanciest of the dozen built in Zwickau and it had come in response to multiple previous crossings that had been built but had survived briefly as they had been destroyed by ice jams, flooding and war. The Findeisen span had been in service for 306 years before it was decomissioned and dismantled in favor of the cantilever truss bridge. 3. The structure itself is 120 meters long, its tower is in the middle of the Mulde River. The width is 15 meters, counting the trusses. Since 1979 and inspite the restoration work in 2003, the bridge has been serving cyclist and pedestrian traffic, carrying a bike trail connecting Zwickau’s City Centre with Reinsdorf, located four kilometers to the east. Its replacement structure is found 200 meters west of the bridge at Dr. Friedrichs Ring (Hwy. 173). That bridge, known as the Adolf Hennecke Bridge and later from 1990 onwards as the Glück-Auf-Brücke, was built in 1979 and connects Zwickau with Chemnitz to the southeast. That bridge is three times as long and twice as wide as the Paradiesbrücke, spanning the river, Highway B-93, the Mulde Bike Trail and Reinsdorfer Strasse. 4. When the bridge was renovated in 2003, the towers were crowned with finials resembling the Matthäus Kirche (St. Matthew’s Church) which was located 400 meters east of the entrance. Additional decorations on the trusses and ornamental lamps were also added making the bridge more attractive to tourists and passers-by. 5. The bridge is located near the site where a former mine and bridge building company used to be located. A memorial site with a miner resting with a beer in the hand can be seen 100 meters northeast of the city side of the entrance. It is also located near the Ebert Palace, whose finial towers can be seen above the trees at the bridge’s east entrance. 6. The bridge was the platform for several historical events affecting Zwickau and beyond. For instance, the name Paradies stammed from Martin Luther’s visit in Zwickau, where he crossed the bridge in rage after a row with the priests before entering a nearby house and declared: “Thank God I found this house. Here is my paradise.” The first was an open-air festival in 1847, featuring a concert by musicians Robert Schumann and his wife, Clara. For two weeks after the end of World War II, the bridge served as a temporary border crossing for American and Soviet troops. That ended in July 1945. And in 1956, a film production in Zwickau included a couple scenes on the bridge. The restoration of the bridge in 2002/03 came after floodwaters almost knocked the bridge off its piers. And most recently, an open-air cafe used to be on the bridge, which happened in 2017. Located near the site of the International Trabant Museum, this bridge appears to be one of the newer truss bridges built no earlier than 25 years ago. While its light brown color makes it look rusty in appearance, its “molded” connections is typical for today’s truss bridges. The Warren through truss bridge with beam portals and Lattice truss overhead bracings used to serve a rail line connecting Pöhlau and Zwickau Central Station. The bridge and the line are now abandoned. Given its age and modern appearance, chances are this bridge will be reused at some point- either as a crossing for cyclists in its place, a street car crossing going south or a railroad crossing at a new location. Time will tell what the City of Zwickau will do with this structure. Like the Paradiesbrücke, the Röhrensteg (translated as the Bridge of Pipes) is another key attraction for Zwickau which should receive international recognition for its design and function. The bridge’s history dates back over 500 years to 1535, when the bridge was first built. At that time, the people in Zwickau needed water for their personal and commercial use. Because the water of the Mulde was dirty and not drinkable, the only source of clean drinking water to be found was at a pond near Reinsdorf- three kilometers away from the bridge. Henceforth, workers created man-powered pumping stations and pipelines made of hard wood from oak trees. The trees were cut down, and after stripping the bark and outer layers, a hole with a diameter of 30 centemeters was dug out by hand, but not before having cut the wood into sections and then connecting them once the hole was “drilled.” The wooden pipeline then transported water down the hill and across this bridge before being distributed throughout the city. A section of this wooden pipeline can still be seen on the bridge, where the overhead beams are still supporting it, providing proof that this practice once existed. A total of at least 17 wooden pipelines had been built for the city of Zwickau to provide drinking water for the community, four fountains where the wooden pipes were connected dating back to the 1700s have been preserved as exhibits at the city center to show this unique engineering feat. This pipeline system was later replaced with more modern systems in the early 20th century, but the bridge itself has withstood the test of time and mother nature. Despite having had substantial damage during the flood of 1790, the Röhrensteg was rebuilt and has retained its original form ever since. The bridge has survived numerous floods and other natural disasters, even after new pier casings were installed in 1940 as part of the project to dredge the Mulde River. In terms of its structure, the Röhrensteg is the only truss bridge (wooden or metal) to have two different designs and two different portals. The bridge features a three-span Queenpost truss design on the western side and a subdivided Warren truss on the eastern side. A-frame portal bracing is found on the city side, X-frame lattice with heel bracings on the Reinsdorf side. Endposts with 45° angles can be found at each portal; together with the wooden siding lining up between the bridge and the abutment, this makes the Röhrensteg one of the most unusual covered bridges to have ever been built. Roofing is of hip style with an angle of 45°, which is similar to the covered bridges found in Switzerland. The bridge serves a bike trail connecting Zwickau’s southern part and Reinsdorf via Oberhohnsdorf, serving as a spur to the Mulde Bike trail that careens along the river. Despite its unusual design and multi-functionality, the bridge is showing its age, and therefore needed to be rehabilitated. This work was completed during three quarters of 2018, having been reopened to traffic in January 2019. Details can be found here. Prior to the rehabilitation, new approach spans on the Reinsdorf side and the pier casing had been built, no extensive work has been done on the bridge prior to its extensive work. More on the work can be found here. Located in the suburb bearing the bridge’s name, the next two bridges are located only 200 meters from each other, each spanning the Mulde. The older bridge is a two-span Warren deck truss without verticals but with stone arch approach spans. Built in 1890, this bridge used to connect the suburbs of Schedewitz and Bockwa, hence it was known by locals as the Bockwaer Brücke. Its predecessors consisted of a multiple-span stone arch bridge that was built in 1842. The northern two spans of this bridge were preserved and used as approach spans for the Warren truss spans. Yet the first crossing was a covered bridge, which was built in 1661. The bridge used to serve a key route along the Silver Road, connecting Zwickau with Schneeberg via Wiesenburg. Much of that route has been taken over by the federal highway B-93. Furthermore, the bridge used to have a streetcar route and a two-lane vehicular crossing. Because of flood damage in 1954, contract was let to the local bridge building firm VEB Brückenbauwerk Zwickau in 1956 to build its replacement span, located 200 meters downstream at the site where the crossing exists today. The new span features a three-span concrete cantilever span, with a length of 70 meters, accommodating four-lanes of traffic plus sidewalks. Construction lasted two years due to difficulties digging through the steep cliffs, requiring the use of explosives before the cliffs were dug out. The road was then laid out, which included a side road that would connect with the main route from the old Bockwaer Brücke before continuing onto Schneeberg. . This was useful for the highway was later extended to the south enroute to Reinsdorf, the motorway exit Zwickau-Ost and later Hartenstein. The new bridge has been serving traffic for over 60 years but age and wear and tear may warrant a much-needed rehabilitation in the future. As for the Bockwaer Brücke, once the new Schedewitz Bridge was opened to traffic in 1958, work commenced to remove the street car tracks, plus halve the roadway to a point where only bikes and pedestrians could use the old bridge. The bridge was then raised 2 meters to avoid damming the river in the event of flooding. Today, the bridge still serves cyclists and pedestrians but work may be needed to make the structure more functionable. Already the Zwickau City Council rejected a proposal to rehabilitate the bridge in 2017, which raises questions on the bridge’s future. Will there be enough locals willing to convince the city council to reconsider, or will indifference and a strive for modernization doom the old structure, whose history is worth preserving, especially as it is part of the history of Zwickau and the Silver Road? Another important crossing to mention is the Cainsdorf Bridge. While little has been written about its history, the 1929 two-span steel deck plate girder span crosses the Zwickau Mulde at the railroad station along the Zwickau-Aue-Johanngeorgenstadt line. The bridge connects Cainsdorf and areas to the west and the eastern edge of Zwickau between Oberhohndorf and the city of Wilkau-Hasslau and provides the lone access to the Planitz district, which includes a restored castle and church, where the present-day Clara Wieck Gymnasium is located. Sadly, the bridge’s condition has deteriorated to a point where only a three-ton limit has been enforced for all vehicles except the city’s bus line. The good news is the bridge is expecting a replacement bridge, to be built on a new alignment connecting both areas, but towards the Oberhohndorf district, thus cutting down the time needed to get to one’s destination in either way. Construction is expected to start in 2019 and finish by 2021. Afterwards, the historic bridge will undergo a thorough rehabilitation that will prolong its life but also allow for only cyclists and pedestrians to cross. This will be a big advantage especially those wishing to catch the train from the train station next to the bridge. A win-win situation that many locals with ties to the bridge will benefit from. Five kilometers further upstream and biking past the Cainsdorf Bridge is the pedestrian bridge at Wiklau-Hasslau, the southernmost suburb of Zwickau. There, one will find a rather unique pedestrian bridge. Built in 2004, the bridge features a pen-like tower, with cables supporting the roadway and the tower itself. The roadway has a curve, allowing cyclist from the east side and Schneeberg to enter as a ramp, as it curves to the right towards the west end. The 145 meter long pedestrian bridge crosses the Mulde River and a pair of railroad tracks that provide train service between Zwickau and Aue to the south. The valley’s hilly and wooded scenery is what the Wilkau-Hasslau Pedestrian Bridge has to offer- along with a short break at a modernized city center, which has a weekly market- before biking on to some more bridges. The tower has a height of 32.2 meters, making it the tallest bridge in Zwickau. Yet to the south of the bridge is an even taller bridge carrying the Motorway A 72. Built in 1995, that bridge spans the deepest of the Mulde River valley in Zwickau, but is the second longest bridges along the stretch between Hof (Bavaria) and Chemnitz. To the north of the pedestrian bridge is the Kirchberg Bridge, perhaps the longest of the “at-level” river crossings over the Zwickau Mulde in the greater Zwickau area. When looking at the bridge from the pedestrian bridge, one could guess that the stone arch bridge, built using sandstone, had three arches. Yet when walking along the streets of Wilkau-Hasslau to get a better, closer look at the bridge, one can see the number of spans being more than double. In fact, eight spans glide over the river and the flood bed with a total length of between 300 and 400 meters. Records reveal that the Luten arch structure was built in 1867 but it appears to have been widened in the early 1990s to better accomodate traffic between the joint community (which was established in 1934) and Kirchberg, located five kilometers to the southwest. This bridge has shown its age as cracks are appearing in the stone arches. 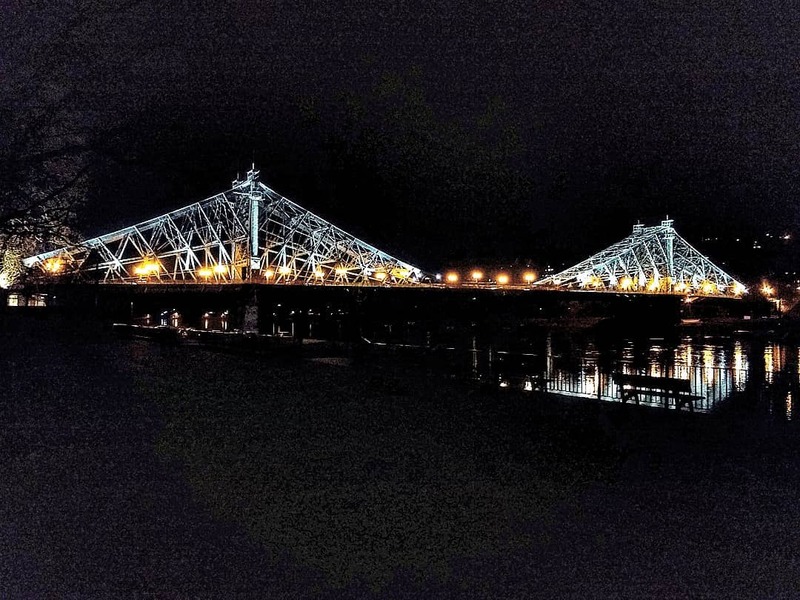 Despite emergency repairs in 2018, a full-blown rehabilitation project to prolong the crossing will most likely occur sometime in 2020. When this happens, most likely the West German style flourescent lighting will disappear in favor of fancier, ornamental lanterns with LED-lighting, which will present a more appropriate flavor for Wilkau-Hasslau. The tallest and longest of Zwickau’s bridges is not located in Zwickau directly, but in neighboring city Wilkau-Hasslau on the south end. The motorway viaduct was originally built in 1937-39 as part of the construction of the motorway connecting Hof with Chemnitz. Ironically, the entire stretch of the highway was not finished until 1993 due to delays caused by World War II and the division of Germany that followed. This stretch was the last built prior to the start of the war and would be used heavily after the war ended. The motorway viaduct continued service until 1995, when it was replaced with a new steel girder viaduct span, built on the piers of the original bridge. The total length is 670 meters with a height of 50 meters, making it one of the longest along the original stretch. It can be seen when entering Wilkau-Hasslau from the northern side. Approximately 350 meters north of the Central Railway Station is the Marienthal Viaduct- the only bridge in this tour guide that does not span the Zwickau Mulde. Spanning a small but deep creek as well as Werdauer Strasse, the eight-span stone arch bridge is the longest in Zwickau, with a total length of 94 meters. With a height of 14 meters above the ground, it is also the highest. If counting the Motorway 72 Viaduct in Wilkau-Hasslau, it is the second longest in this tour guide. The viaduct is the shortest of the noted viaducts along the Nuremberg-Hof-Dresden Magistrate with the next ones in both directions being at least twice as long. The bridge was built in 1869 as the railroad was being built for Zwickau from the east. It was built using red brick, sandstone and porphyr. The bridge still sees use on a daily basis for as many as 10 trains cross this bridge per hour; most of them passenger train services connecting Zwickau with Glauchau, Chemnitz and Dresden. Albeit a regional service route, it is expected that this route will be connected to the long-distance train in the future, for the Bahn plans to electrify the line south of Hof and in the end have InterCity trains going from Dresden to Munich. A map of the bridges in Zwickau is enclosed in case you would like to visit the bridges yourself. Some of the bridges are mystery bridges where an article has been written on each one and can be found in the Chronicles. Others feature just a pic of the bridge indicating its existence but has no information on it to date. If you have any more information on Zwickau’s bridges that need to be added, please contact Jason Smith at the Chronicles, using the contact form below. All information will be added to this guide.